Herzlich Willkommen zur neuen Wochenchallenge vom Global Design Project. Diese Woche heisst es wieder„CASE the Designer“. Es geht also darum den Designer eines Bastelwerks zu kopieren. Dabei ist es egal ob man sich für die Farbkombination, die Materialien oder das Layout der Karte entscheidet – oder vielleicht alles zusammen kopiert. Ich habe mir für die Farben entschieden und auch zum Teil das Layout. Die Karte rechts ist von Brian King, ein Demonstrator-Kollege aus den USA. Welcome to the new weekly challenge from our Global Desgin Project. This week it’s CASE the designer time again. So we are asked to copy someone else. It doesn’t matter which parts you copy. may it be the colors, the layout or even everything. I decided to go with the colors and parts of the layout. The original was made by Brian King, a US demonstrator colleague. 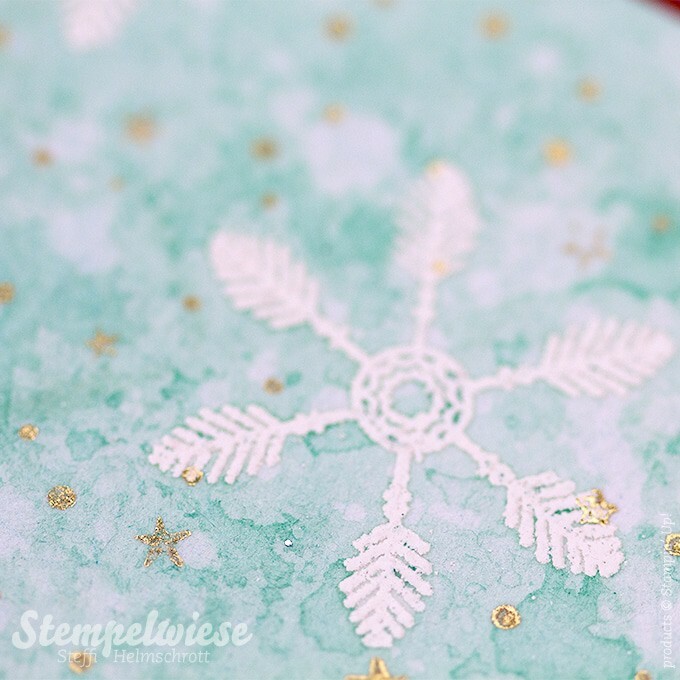 After embossing the snow flakes on the background and coloring them with Pool Party i stamped the golden mini stars at the end. After having finished everything i think it may have been a bit too much but i didn’t have the time to start over. Maybe i just shouldn’t be so self-critical 🙂 My only concern is that the designer vellum doesn’t really stand out anymore. Die goldenen Sternchen habe ich mit dem Encore Stempelkissen (Amazon») gestempelt. I’ve stamped the golden stars with the Encore Inkpad from Amazon. Nun bin ich gespannt was ihr schönes bastelt. Wenn ihr an der Challenge mitmachen wollt, versucht die Karte von Brian nachzuarbeiten und tragt euch dann hier mit in die Liste ein. Solltet ihr Fragen oder Probleme haben, meldet euch! Schönen Wochenstart! I’d be happy to see what you create from Brians Card. Let yourselves inspire and share your work with us. Post it to our project blog and win the weekly design challenge. If you have any questions or problems, feel free to ask in the comments or leave me an email. Steffi – This is ABSOLUTELY gorgeous! I love the backdrop that you created with the snowflakes and gold – just beautiful. 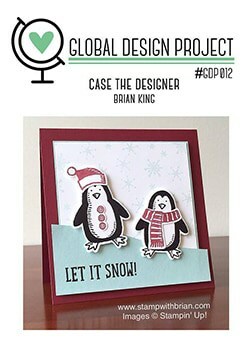 I’m honored that you created such a gorgeous project inspired by my silly card, and I’m happy to serve on the Global Design Project team with you. Thanks! STUNNING. That background is crazy amazing. I love the vellum as it adds softness. I am loving that background! I need to try this! Steffi, this is truly a stunning card. I love, love, love the background you have painted.These color look so beautiful with the gold and the vellum. I am in awe. Your background is stunning, you are so clever Steffi!